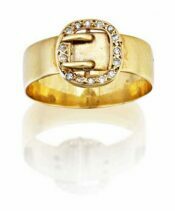 Home » Products » Rings » Diamond Rings » A Vintage Platinum 3 Stone Diamond ring. A platinum vintage half hoop ring with filigree underbezel adn ahoulders grain set with 3 x approximately 0.65 carat (4.8 x 3.1mm diameter)old mine cut diamonds, Colour H-I, Clarity VS1. The runded shank is 1.6mm wide with a concave groove down the centre.